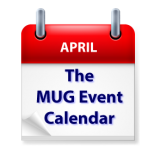 The Mac Observer’s John Martellaro at a Colorado group and The Houston Chronicle’s Dwight Silverman at a Texas group are the featured meetings on this week’s MUG Event Calendar. A Florida group will discuss robotics and iCloud will be covered at groups in Wisconsin and New York. Other topics for the week include iOS 9.3, the iPad Pro 9.7”, VueScan, navigation apps, browser extensions and privacy.